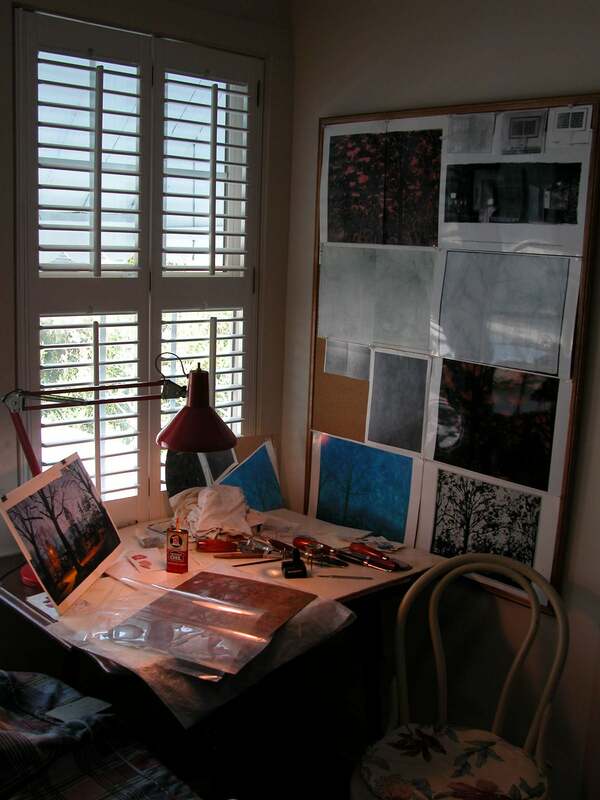 Each summer I return to the family beach house in North Carolina for a few weeks, and for as long as I can remember I’ve set up studio in an upper room where I continue working on my drawing and print projects. The new setting invariably helps me rethink my current investigations while infusing my journal with new influences and energies. 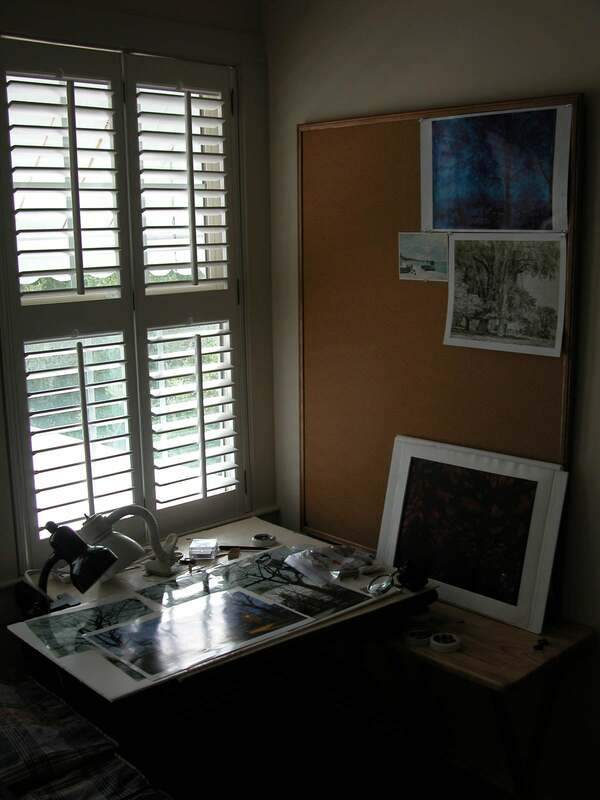 The temporary studio is really just a corner of a room; a worktable, a chair, and a single bed where I prop my books and spread out my brushes and other tools. 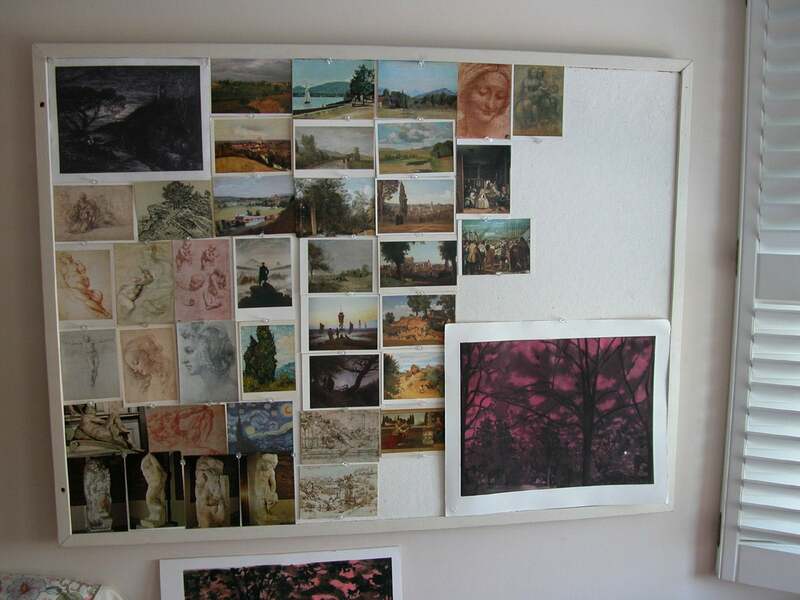 I always pull out two bulletin boards that are tucked in the closet and hang them on either side of my table; it is to these cork boards I pin up my projects in order to muse on them in a different light. As I work, I occasionally drift through a stack of art postcards brought from home; handfuls pulled randomly from my collections. I slowly sort through the images; selecting ones that strike my fancy, placing them on the boards in arrangements I like. Postcards of masterworks that I’ve passed over in previous years may suddenly grab my interest. The process is done in a very relaxed manner with the basic goal being to enjoy myself while taking in fresh ideas and information. In recent years I’ve begun to take photographs of my studio setup as I conclude my summer stay. Above can be seen images from the summer of 2006, a period when I was working on the copper plate for my print Night II. I was steadily scraping and reworking the already etched plate with burnishers and scalpels. As I developed the surface, I compared it to the proof impression that I had brought with me. It was a period when I was working towards a final state of the print that was to be published later that year. The studio of summer 2009 can be seen in the photographs below. This season I continued work on Night II, however, rather than working on the printing plate, I decided to hand-work one of the edition impressions. 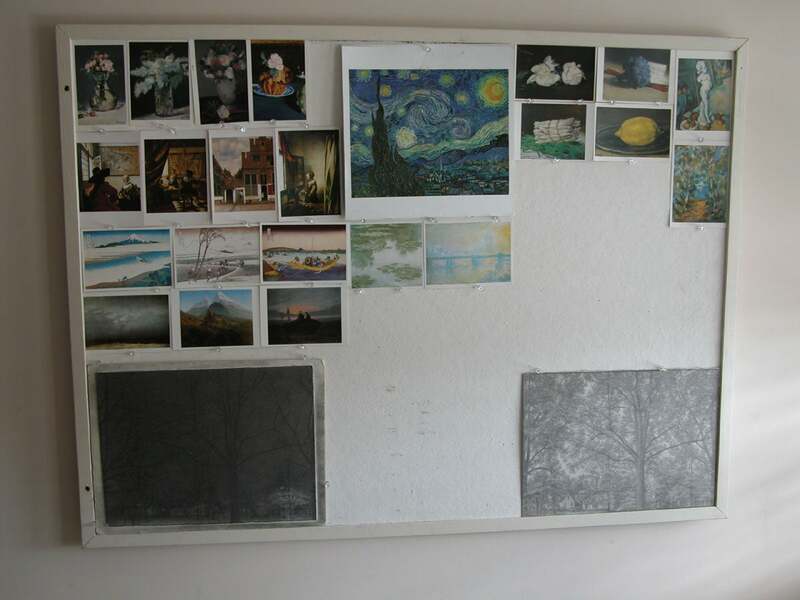 It can be seen in the photograph leaning against the base of the vertical bulletin board. With the print temporarily mounted to foam core, I scraped in fine detail into the surface using a single-edge razor blade as a means of brightening certain areas, while painting in other elements with a fine point brush using watercolor and gouache. By doing so, the print has become a unique, hand drawn object. While I rarely use photographs as references for my work, the summer takes me away from my usual neighborhood landscape and I find it useful to have digital images and drawings to jog my memory. Various examples of these can be seen sitting on my drawing table and pinned to the bulletin boards. Simultaneous to focusing on projects like Night II described above, I also continue working in my journal. I have never viewed my journal as a travelogue and rarely make efforts to cultivate new places to draw, however recurring visits to the beach occasionally stimulate innovations in my book. Some interesting shifts occurred in my journal this year; more about this in a subsequent entry. (To be continued).